NATHAN B. HANNAH is a Shareholder in the Tucson office. 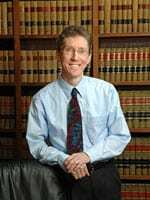 He practices exclusively in the areas of estate planning, uncontested estate and trust administrations, and real estate and commercial transactions. Mr. Hannah has been writing wills and trusts and assisting in the administration of estates and trusts for over twenty-five years. He has drafted contracts and other documents and assisted in the closings for many real estate transactions throughout Arizona, including farm, ranch, development, and investment properties. Mr. Hannah’s real estate practice emphasizes sales and acquisitions, title and lien matters, foreclosures and taxation. Mr. Hannah’s estate planning and administration practice includes the creation of all types of estate plans and trusts, trust and estate administration and tax planning. He also represents individuals and families in guardianship and conservatorship matters. Mr. Hannah’s commercial transactions practice includes business formations, asset sales and purchases, and contracts. Mr. Hannah publishes a monthly newsletter about real estate, estate planning, and tax law issues of interest to clients and the community.